Beginning in late August, the minimum temperatures were generally somewhat lower than observed in the past decade whereas the PSC area was as large as in 1995. Between August and October, the polar vortex was one of the smallest in the past decade. 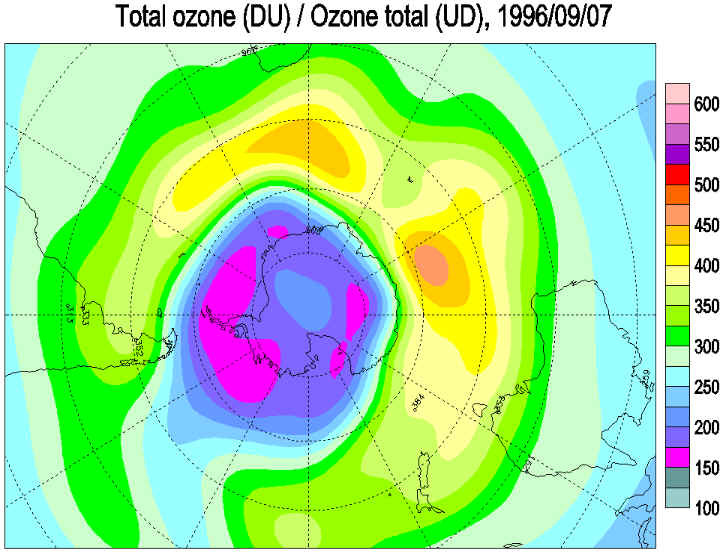 Even though the vortex area was very small during much of the 1996 ozone hole season, the monthly average ozone hole areas were unusually large. 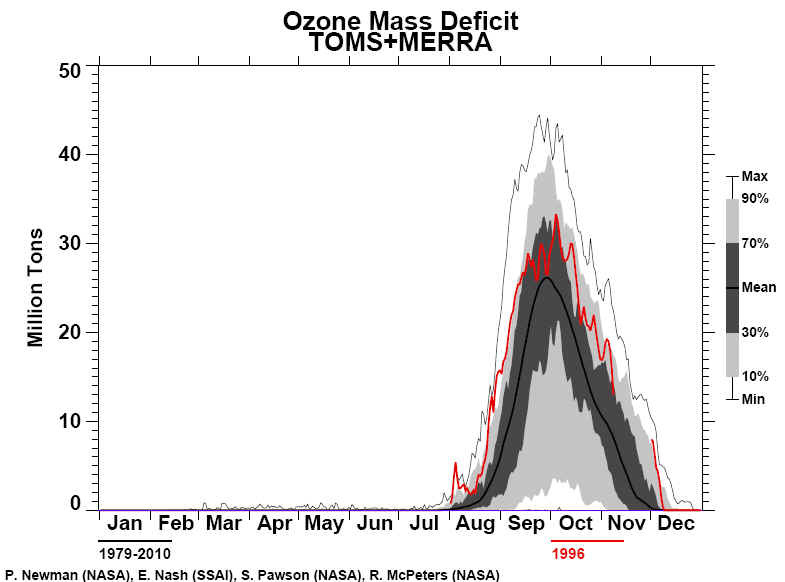 Moreover, the duration of the ozone hole exceeded the ten previous years, beginning in late August with an unusually rapid increase in size and finally ending well into December. 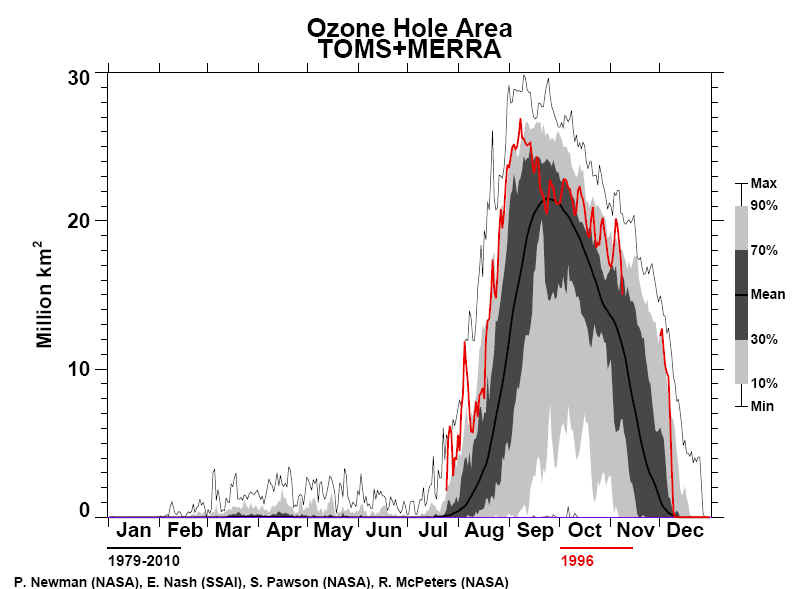 In early August a "mini hole" with ozone values up to 50% below pre-ozone hole norms appeared over the Antarctic Peninsula. Then in early October, ozone values of 45 to 60% below pre-ozone hole norms were observed over most of Antarctica, however, the area with ozone values more than 50% below norms was less than the previous two years. 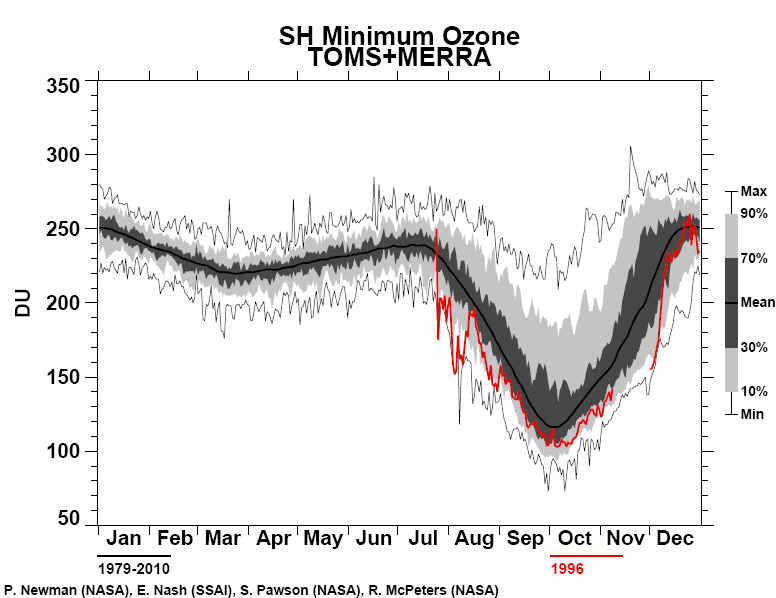 Through mid October the ozone hole was somewhat circular before it changed to slightly elongated. Furthermore, in late October the ozone hole stretched to 50° South latitude, which is a rare event. The "mini hole" was sufficiently large to have affected the southern tip of South America with ozone values of 30% deviation from pre-ozone hole norms. This was the first early observation of low ozone in this populated region since 1991. Later, Ushuaia measured ozone hole values on five days, twice in both mid September and late November and once in mid October. 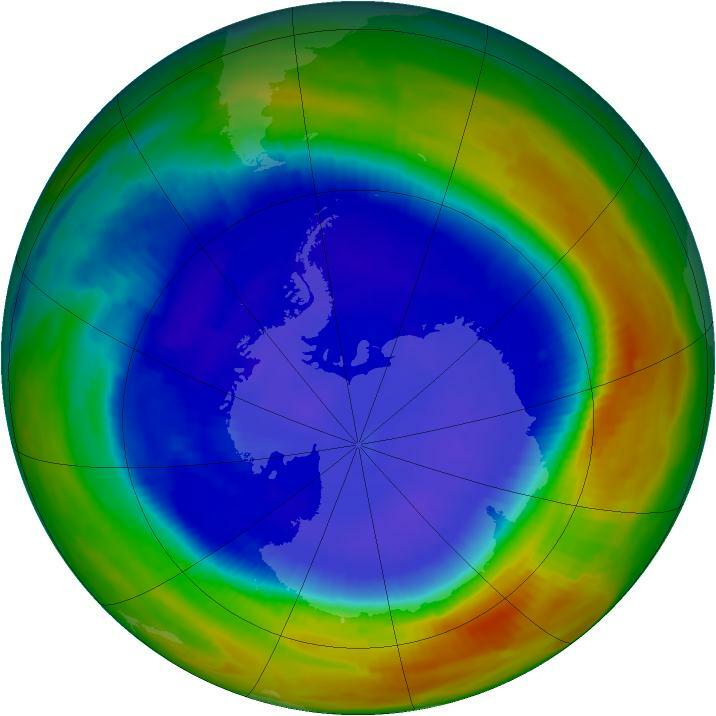 However, New Zealand and Australia in general did not observe low column ozone, although air 20% below pre-ozone hole norms was observed on a single day over the southern coast of New Zealand. British Antarctic Survey summary 1996-Routine ozone measurements from Halley station do not start until towards the end of August because the sun is not high enough to permit measurements. Mean total ozone values fell from an estimated 260 DU in early July to around 140 DU in mid September and then declined more slowly to reach 125 DU in early October. They climbed to around 180 DU by late October, but remained at that level throughout November. In early December, ozone levels began to rise and reached a peak of around 300 DU late in the month. This is some 80 DU lower than the pre-ozone hole average peak value. After that, values slowly declined and had reached around 230 DU by the end of the season. Values only briefly exceeded the lower bound of the variation from the long-term mean late in the season. The lowest mean daily value seen (114 DU on October 8) is comparable to that of the previous few years.